The type 1 insulin-like growth factor receptor (IGF-IR) sends several signals, some of which are contradictory. When the concentrations of insulin receptor substrate 1 (IRS-1), a major substrate of the IGF-IR, are high, the signal is mitogenic, anti-apoptotic, and can even cause malignant transformation. However, in the absence of IRS-1, the IGF-IR sends a differentiation signal, which leads to granulocytic differentiation in haemopoietic cells. The mitogenic signal of the IGF-IR/IRS-1 combination depends largely, but not exclusively, on the activation of the phosphatidylinositol-3 kinase (PI3K). The type 1 insulin-like growth factor receptor (IGF-IR), activated by its ligands, controls the proliferation of cells in a variety of ways, namely: (1) It sends a mitogenic signal. (2) It protects cells from a variety of apoptotic injuries. (3) It promotes growth in cell size (a requirement for cell division). (4) It plays a crucial role in the establishment and maintenance of the transformed phenotype. (5) It regulates cell adhesion and cell motility. (6) It can induce terminal differentiation. The IGF-IR is expressed in most cell types, the only known exceptions being hepatocytes and mature B cells. Because the IGF-IR is found ubiquitously, it participates in the growth regulation of many cell types, even though the primary growth factor might be another molecule. These various functions of the IGF-IR have been discussed in recent reviews, to which the reader is referred for detailed references.1–5 In our present communication, we wish to focus on two characteristics of the IGF-IR that are seemingly contradictory; that is, the ability of the receptor to send signals for either malignant transformation or differentiation. Although the mitogenicity of the IGF-IR has been known for a long time,6 there is also a substantial amount of literature on its ability to send a differentiation signal (reviewed in Baserga and Morrione3). For instance, under certain conditions, myoblasts, osteoblasts, adipocytes, oligodendrocytes, neurones, and haemopoietic cells can be induced to differentiate by IGF-I or IGF-II. The role of the IGF system in differentiation and transformation can be studied in haemopoietic cells. Differentiation of haemopoietic cells occurs only if the cells first undergo one or two rounds of replication.7–9 This is true for instance for the granulocytic colony stimulating factor (G-CSF), as well as for IGF-I mediated differentiation.10 Initially, we will review the role of the IGF-IR in malignant transformation and in differentiation. Because IRS-1 plays a dominant role in directing IGF-IR signalling towards either transformation or differentiation, we will later examine additional, new data on the role of IRS-1 in these two processes. From the time of our original observation that the SV40 T antigen failed to transform R cells11 we hypothesised as a corollary that the downregulation of the IGF-IR in malignant cells ought to reverse the transformed phenotype. In fact, downregulation of IGF-IR function, either by antisense strategies or by dominant negative mutants, causes massive apoptosis of tumour cells in vitro and in vivo. As a consequence of the extensive apoptosis of tumour cells, downregulation of IGF-IR function results in inhibition of tumorigenesis and metastases in experimental animals. The evidence and the references on this topic have been summarised in a recent review by Baserga.5 An interesting feature of IGF-IR targeting is that it has only a modest effect on cells in monolayer cultures. It seems that the IGF-IR is not an absolute requirement for normal growth, as confirmed also by genetic experiments.25 It is, however, a strict requirement for anchorage independent growth.26 Human prostatic tumour cells stably expressing a dominant negative mutant of the IGF-IR are not inhibited when growing in monolayer, but fail to form colonies in soft agar or tumours in mice.27 This differential effect on normal growth (cells in monolayer cultures) and abnormal growth (anchorage independent growth) indicates that targeting of the IGF-IR is a promising candidate for use in cancer chemotherapy. As already mentioned, the response of haemopoietic cells to IGF-I can be studied in 32D cells. 32D cells are murine haemopoietic cells of the myeloid lineage, which undergo apoptosis within 24 hours of withdrawal of interleukin 3 (IL-3).7 32D cells have very low levels of IGF-IR and do not express IRS-1 or IRS-2,28, 29 which are among the major substrates of the IGF-IR and the insulin receptor (IR).30 When 32D cells express a human IGF-IR cDNA (32D IGF-IR cells), they survive in the absence of IL-3 and, with the addition of IGF-I, they grow exponentially for about 48 hours.31 After 48 hours, the cells begin to differentiate along the granulocytic pathway, and eventually decrease in number,31 as one would expect from terminally differentiated cells. If 32D IGF-IR cells are stably transfected with IRS-1 cDNA, to generate 32D IGF-IR/IRS1 cells, the cells no longer differentiate,31 grow indefinitely in the absence of IL-3, and form tumours in animals.32 It should be mentioned that 32D cells expressing only the IGF-IR cannot be passaged without IL-3, and neither do they form tumours in animals. 32D cells overexpressing only IRS-1 do not even survive for 24 hours in the absence of IL-3.29, 31, 33 Thus, individually, IRS-1 or the IGF-IR cannot transform 32D cells, or even induce their prolonged survival. However, in combination, they cause malignant transformation of 32D cells. An intriguing aspect of this model (32D/IGF-IR cells versus 32D/IGF-IR/IRS-1 cells) is that 32D IGF-IR cells are stimulated to proliferate for the first 48 hours, before they differentiate. It means that, in terms of cell proliferation, one could not detect any difference for the first two days between 32D IGF-IR and 32D IGF-IR/IRS-1 cells. Although both cell lines are implementing a proliferative programme, only 32D IGF-IR cells are also initiating a differentiation programme. This was demonstrated by looking at an early marker of differentiation—myeloperoxidase (MPO) mRNA. In 32D IGF-R cells, MPO mRNA is already detectable within 24 hours of changing the cells from IL-3 to IGF-I. No changes in MPO RNA values occur in 32D IGF-IR/IRS1 cells.32 Thus, it seems that the IGF-IR does indeed activate both a proliferative and a differentiation programme, with the differentiation programme eventually prevailing. The expression of IRS-1 extinguishes the differentiation programme, leaving the proliferative programme intact. The crucial role of IRS-1 in inhibiting differentiation and causing malignant transformation has prompted us to investigate the mechanism(s) involved in this remarkable switching of programmes. As a beginning, we have generated several mutants of IRS-1 and have asked which domains of IRS-1 are necessary for the inhibition of differentiation. The results of this inquiry constitute the second part of our communication, which presents new data. Figure 1A shows the IRS-1 mutants that we have used and fig 1B gives their levels of expression. All cell lines were mixed populations obtained by the transduction of 32D IGF-IR cells with a retroviral vector,46 expressing the appropriate construct. The mutants, generated by polymerase chain reaction (PCR) mutagenesis46 included a deletion of the PTB domain (δPTB), a deletion of the Pleckstrin domain (δPH), and point mutants at Y608, Y891, and Y935, single or multiple. Several of these mutant IRS-1 molecules have also been studied in 32D cells by Yenush et al,47 but there are two important differences between their studies and ours. 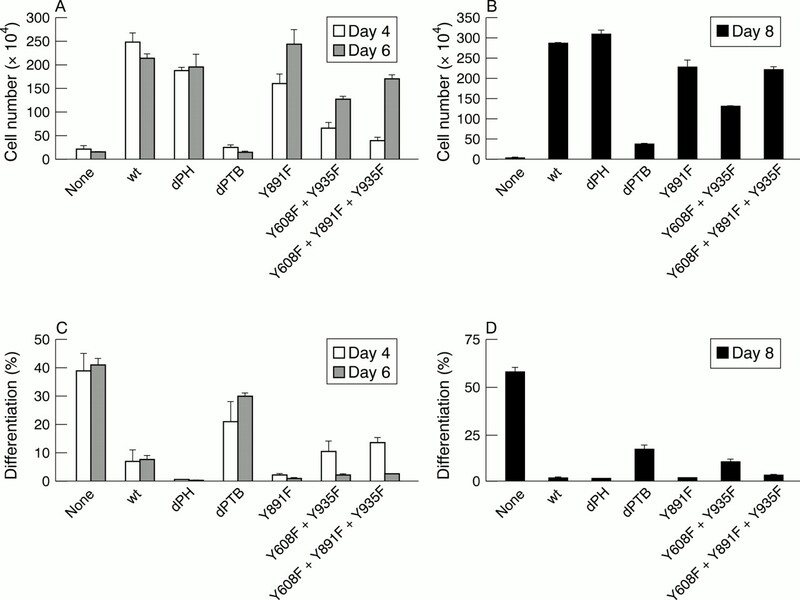 Yenush and colleagues47 used the IR, which, by itself, cannot protect 32D cells from apoptosis,48 even for 24 hours. Furthermore, Yenush and colleagues47 limited their studies to short term events (first 48 hours), whereas our studies focus on long term events, such as transformation and differentiation. Nonetheless, their experiments have been extremely useful in planning our approach. Figure 2 summarises the results on growth and differentiation of these mixed populations expressing mutant IRS-1 proteins. All these cell lines grew very well in IL-3 and all underwent apoptosis after IL-3 withdrawal, unless supplemented with IGF-I. Figure 2A shows the growth of these cell lines in IGF-I, at four and six days after IL-3 withdrawal. Because all of these cell lines were generated from 32D IGF-IR cells, they all grew in the first 48 hours, then two of the cell lines stopped growing and even decreased in number. The two cell lines are those transfected with an empty retroviral vector (therefore similar to parental 32D IGF-IR cells), or with the δPTB mutant of IRS-1. The growth of the cells with mutations at tyrosines 608 and 935 (binding sites for the p85 subunit of PI3K) was somewhat slower, but they kept growing from days 4–6. Aliquots of these cells were taken at day 4 and re-plated under the same condition for another four days, to test their IL-3 independence. The cell lines that grew in the first six days grew again in the absence of IL-3 for another four days, thus showing that they had acquired IL-3 independence. The empty vector and the δPTB cell lines again failed to grow. Figure 2C and D shows the extent of differentiation of the same mixed populations under the same conditions. These two panels can be summarised by saying that growth and differentiation are inversely correlated, as one would expect. The less the cells grow, the more they differentiate. These experiments were repeated several times by different operators, with consistent results. They show that the PTB domain of IRS-1 is necessary for the inhibition of differentiation. It can be argued that differentiation in 32D IGF-IR/δPTB cells is somewhat inhibited, when compared with the parental 32D IGF-IR cells. Nonetheless, the extent of differentiation is substantial and clearly above that of cells expressing the wild-type IRS-1 or other mutant IRS-1 molecules. As already mentioned, the inhibition of IGF-I mediated differentiation by ectopic expression of IRS-1 correlates with the sustained activation of p70S6K.32 We determined p70S6K activation by using an antibody to phosphorylated threonine 389.32 Figure 3 shows the results of a typical experiment. All the mutant IRS-1 molecules that were active in promoting growth also gave a sustained p70S6K activation, extending to at least 60 minutes after IGF-I stimulation. As already reported, p70S6K activation is reduced in 32D IGF-IR cells (no IRS-1). 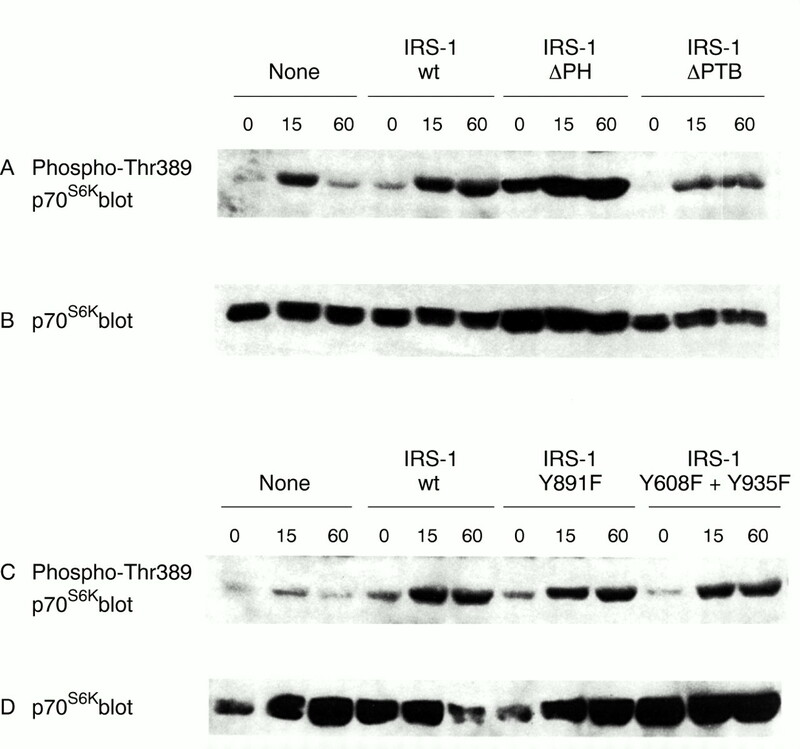 It is also reduced in 32D IGF-IR cells, expressing the δPTB mutant of IRS-1. The picture that is emerging is the dual signalling of the IGF-IR, one signal inducing proliferation, and a simultaneous signal inducing differentiation. In the absence of functional IRS-1, the differentiation signal eventually prevails over the proliferation signal, as happens also with other growth factors that induce the differentiation of haemopoietic or neuronal cells. Expression of IRS-1 (or one of its active mutants) extinguishes the differentiation programme, leaving the proliferative programme intact. There are two additional comments that should be made. The first is that IRS-1 exerts a profound negative influence on differentiation. Cells prone to differentiation often do not express IRS-1, or express very small amounts.49 Furthermore, stimuli that induce differentiation often cause a decrease in IRS-1.50 Conversely, overexpression of IRS-1 consistently decreases the extent of differentiation.31, 32 The second comment concerns the pathways used by the IGF-IR for mitogenesis and survival. It is generally agreed that the main mitogenic/survival pathway depends on the activation of the PI3K pathway.1 However, Peruzzi et al have found that, in the absence of IRS-1, two other pathways, not shared with the IR, originate from the IGF-IR.48 The second pathway originates from Y950 and depends on the activation of the mitogen activate protein kinase (MAPK) pathway, whereas the third pathway originates from serines 1280–3 and requires the mitochondrial translocation of Raf1. Interestingly, Navarro and Baserga51 have found that two of these three pathways are both necessary and sufficient for the mitogenic/survival signal. It does not matter which two pathways are operating, as long as two of them are intact. The IGF-IR sends contradictory signals to cells.5 It can send a powerful mitogenic and anti-apoptotic signal or it can induce differentiation, which results in growth arrest, differentiation, and cell death. The choice between the two signals seems to depend to a large extent on the availability of substrates. In the absence of IRS-1 (or when concentrations are low), the IGF-IR tends to generate a differentiation signal. When IRS-1 is expressed, the signal is not only mitogenic, but it has the ability to transform cells.32 These contradictions need to be kept in mind if we wish to understand correctly the role of the IGF system in cancer biology. This work is supported by grant CA 78890 from the National Institutes of Health. Blakesley VA, Butler AA, Koval AP, et al. IGF-I receptor function: transducing the IGF-I signal into intracellular events. In: Rosenfeld RG, Roberts CT, Jr, eds. The IGF system. Totowa, NJ: Humana Press, 1999:143–63. Baserga R, Prisco M, Hongo A. IGFs and cell growth. In: Rosenfeld RG, Roberts CT, Jr, eds. The IGF system. Totowa, NJ: Humana Press, 1999:329–53. Baserga R, Morrione A. Differentiation and malignant transformation: two roads diverged in a wood. J Cell Biochem 1999;32/33:68–75. Grimberg A, Cohen P. Role of insulin-like growth factors and their binding proteins in growth control and carcinogenesis. J Cell Physiol 2000;183:1–9. Baserga R. The contradictions of the IGF-I receptor. Oncogene 2000;19:5574–81. Scher CD, Shephard RC, Antoniades HN, et al. Platelet derived growth factor and the regulation of the mammalian fibroblast cell cycles. Biochim Biophys Acta 1979;560:217–41. Valtieri M, Tweardy DJ, Caracciolo D, et al. Cytokine dependent granulocytic differentiation. J Immunol 1987;138:3829–35. Brown G, Choudhry MA, Durham J, et al. Monocytically differentiating HL60 cells proliferate rapidly before they mature. Exp Cell Res 1999;253:511–18. Ward AC, Smith L, de Koning JP, et al. Multiple signals mediate proliferation, differentiation and survival from the granulocyte-colony stimulating factor receptor in myeloid 32D cells. J Biol Chem 1999 274:14956–62. Liu Q, Ning W, Dantzer R, et al. Activation of protein kinase C-zeta and phosphatidylinositol 3`-kinase and promotion of macrophage differentiation by insulin-like growth factor 1. J Immunol 1998;160:1393–401. Sell C, Rubini M, Rubin R, et al. Simian virus 40 large tumor antigen is unable to transform mouse embryonic fibroblasts lacking type-1 IGF receptor. Proc Natl Acad Sci U S A 1993;90:11217–21. Liu J-P, Baker J, Perkins AS, et al. Mice carrying null mutations of the genes encoding insulin-like growth factor I (igf-1) and type 1 IGF receptor (Igf1r). Cell 1993;75:59–72. Baker J, Liu J-P, Robertson EJ, et al. Role of insulin-like growth factors in embryonic and postnatal growth. Cell 1993;75:73–82. Sell C, Dumenil G, Deveaud C, et al. Effect of a null mutation of the type 1 IGF receptor gene on growth and transformation of mouse embryo fibroblasts. Mol Cell Biol 1994;14:3604–12. Morrione A, DeAngelis T, Baserga R. Failure of the bovine papilloma virus to transform mouse embryo fibroblasts with a targeted disruption of the insulin-like growth factor I receptor gene. J Virol 1995;69:5300–3. Steller MA , Zou Z, Schiller JT, et al. Transformation by human papilloma virus 16 E6 and E7: role of the insulin-like growth factor 1 receptor. Cancer Res 1996;56:5087–91. Toretsky JA, Kalebic T, Blakesley V, et al. The insulin-like growth factor-I receptor is required for EWS/FLI-1 transformation of fibroblasts. J Biol Chem 1997;272:30822–7. Valentinis B, Morrione A, Taylor SJ, et al. Insulin-like growth factor 1 receptor signaling in transformation by src oncogene. Mol Cell Biol 1997;17:3744–54. Coppola D, Ferber A, Miura M, et al. A functional insulin-like growth factor I receptor is required for the mitogenic and transforming activities of the epidermal growth factor receptor. Mol Cell Biol 1994;14:4588–95. DeAngelis T, Ferber A, Baserga R. The insulin-like growth factor I receptor is required for the mitogenic and transforming activities of the platelet-derived growth factor receptor. J Cell Physiol 1995;164:214–21. Liu JL, Blakesley VA, Gutkind JS, et al. The constitutively active mutant Gα13 transforms mouse fibroblast cells deficient in insulin-like growth factor-I receptor. J Biol Chem 1997;272:29438–41. Kaleko M, Rutter WG, Miller AD. Overexpression of the human insulin-like growth factor 1 receptor promotes ligand-dependent neoplastic transformation. Mol Cell Biol 1990;10:464–73. Liu D, Zong C, Wang LH. Distinctive effects of the carboxyl-terminal sequence of the insulin-like growth factor I receptor on its signaling functions. J Virol 1993;67:6835–40. Pietrzkowski Z, Lammers R, Carpenter G, et al. Constitutive expression of insulin-like growth factor 1 and insulin-like growth factor 1 receptor abrogates all requirements for exogenous growth factors. Cell Growth Differ 1992;3:199–205. Ludwig T, Eggenschwiler J, Fisher P, et al. Mouse mutants lacking the type 2 IGF receptor (IGF2R) are rescued from perinatal lethality in Igf2 and Igf1r null backgrounds. Dev Biol 1996;177:517–35. Baserga R. The price of independence. Exp Cell Res 1997;236:1–3. Reiss K, D'Ambrosio C, Tu X, et al. Inhibition of tumor growth by a dominant negative mutant of the insulin-like growth factor I receptor with the by-stander effect. Clin Cancer Res 1998;4:2647–55. Wang LM, Myers MG, Jr, Sun XJ, et al. IRS-1: essential for insulin- and IL-4-stimulated mitogenesis in hemopoietic cells. Science 1993;261:1591–4. Zhou-Li F, XuS-Q, Dews M, et al. Co-operation of simian virus 40 T antigen and insulin receptor substrate-1 in protection from apoptosis induced by interleukin-3 withdrawal. Oncogene 1997;15:961–70. White MF. The IRS-signalling system: a network of docking proteins that mediate insulin action. Mol Cell Biochem 1998;182:3–11. Valentinis B, Romano G, Peruzzi F, et al. Growth and differentiation signals by the insulin-like growth factor 1 receptor in hemopoietic cells are mediated through different pathways. J Biol Chem 1999;274:12423–30. Valentinis B, Navarro M, Zanocco-Marani T, et al. Insulin receptor substrate-1, p70S6K and cell size in transformation and differentiation of hemopoietic cells. J Biol Chem 2000;275:25451–9. Zamorano J, Wang HY, Wang L-M. IL-4 protects cells from apoptosis via the insulin receptor substrate pathway and a second independent signaling pathway. J Immunol 1996;157:4926–34. Soon L, Flechner L, Gutkind JS, et al. Insulin-like growth factor 1 synergizes with interleukin 4 for hematopoietic cell proliferation independent of insulin receptor substrate expression. Mol Cell Biol 1999;19:3816–28. D'Ambrosio C, Keller SR, Morrione A, et al. Transforming potential of the insulin receptor substrate 1. Cell Growth Differ 1995;6:557–62. Tanaka S, ItoT, Wands JR. Neoplastic transformation induced by insulin receptor substrate-1 overexpression requires an interaction with both Grb2 and Syp signaling molecules. J Biol Chem 1996;271:14610–16. Myers MG, Jr, Grammar TC, Wang LM, et al. Insulin receptor substrate-1 mediates phosphatidykinositol 3`-kinase and p70S6K signaling during insulin, insulin-like growth factor-I and interleukin-4 stimulation. J Biol Chem 1994;269:28783–9. Dufner A, Thomas G. Ribosomal S6 kinase signaling and the control of translation. Exp Cell Res 1999;253:100–9. Bohni R, Riesco-Escovar J, Oldham S, et al. Autonomous control of cell and organ size by CHICO, a drosophila homolog of vertebrate IRS-1. Cell 1999;97:865–75. Verdu J, Buratovich MA, Wilder EL, et al. Cell-autonomous regulation of cell and organ growth in drosophila by Akt/PKB. Nat Cell Biol 1999;1:500–6. Montagne J, Stewart MJ, Stocker H, et al. Drosophila 6 kinase: a regulator of cell size. Science 1999;285:2126–9. Shima H, Pende M., Chen Y, et al. Disruption of the p70S6K/p85S6K gene reveals a small mouse phenotype and a new functional S6 kinase. EMBO J 1998;17:6649–59. Surmacz E, Kaczmarek L, Ronning O, et al. Activation of the ribosomal DNA promoter in cells exposed to insulin-like growth factor 1. Mol Cell Biol 1987;7:657–63. Rogalsky V, Todorov G, Moran D. Translocation of retinoblastoma protein associated with tumor cell growth inhibition. Biochem Biophys Res Commun 1993;192:1139–46. Comai L, Song Y, Tan C, et al. Inhibition of RNA polymerase I transcription in differentiated myeloid leukemia cells by inactivation of selectivity factor 1. Cell Growth Differ 2000;11:63–70. Romano G, Prisco M, Zanocco-Marani T. Dissociation between resistance to apoptosis and the transformed phenotype in IGF-I receptor signaling. J Cell Biochem 1999;72:294–310. Yenush L, Zanella C, Uchida T. The pleckstrin homology and phosphotyrosine binding domains of insulin receptor substrate 1 mediate inhibition of apoptosis by insulin. Mol Cell Biol 1998;18:6784–94. Peruzzi F, Prisco M, Dews M, et al. Multiple signaling pathways of the IGF-I receptor in protection from apoptosis. Mol Cell Biol 1999;19:7203–15. Morrione A, Romano G, Navarro M, et al. Insulin-like growth factor 1 receptor signaling in differentiation of neuronal H19–7 cells. Cancer Res 2000;60:2263–72. Sarbassov DD, Peterson CA. Insulin receptor substrate-1 and phosphatidylinositol3-kinase regulate extracellular signal-regulated kinase-dependent and -independent signaling pathways during differentiation. Mol Endocrinol 1998;12:1870–8. Navarro M, Baserga R. Limited redundancy of survival signals from the type 1 insulin-like growth factor receptor. Endocrinology 2001;142:1073–81.